Remember my post about my cute little habit of saving empty tissue boxes that had attractive designs? I claimed it was harmless. Now I realize it is not. I’ve just seen a television show about a hoarder. Her bedroom, which is a chaotic mess she can’t sleep in, has (among many other things) piles of empty tissue boxes. I saw them against the wall, several feet high, and also scattered all over her mattress. She can’t make her bed because the tissue boxes have pride of place instead of the human. 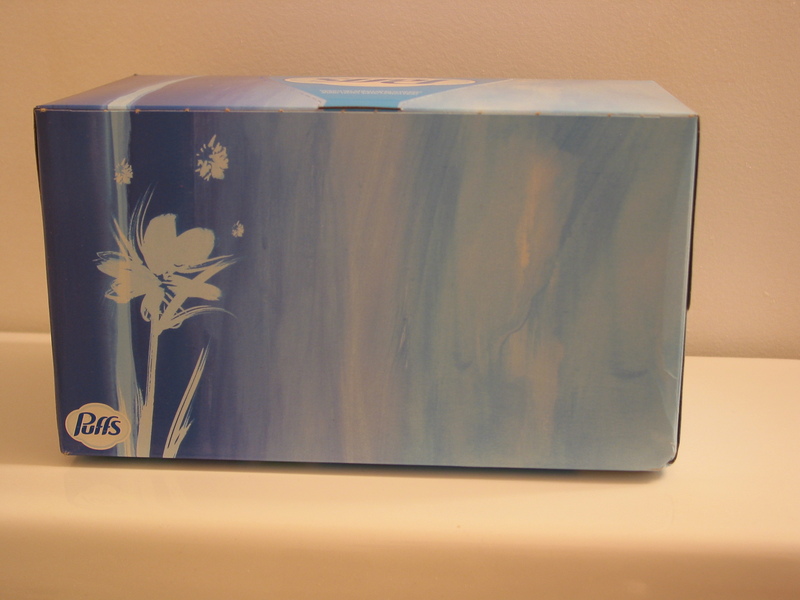 I even recognized a Puffs tissue box design that I think is very handsome and have made a point of buying myself. I’ve just checked the linen closet where I keep my empty tissue boxes (we have three linen closets, which is why there is plenty of space to keep empty tissue boxes). I have only four empty boxes. I think I’m okay for now, but I’m not sure I need the fourth box since it matches no decor in my house. I’m keeping it because it’s pretty, no other reason. I’ll be watching myself. If these boxes don’t get used in a reasonable time, they will be flattened and recycled despite their innate beauty or their match to my decor. I have to trust that the universre will bring me new matches to my decor, and new objects of temporary beauty. Maybe I’ll take a digital photo of the empty boxes, or scan a pattern. Still, out they will go. I refuse to head down the slippery slope to clutter. It’s scary to see how easily a normal person can have similar habits to someone who is an extreme hoarder. If we are color-sensitive, if we appreciate beauty, if we want to be surrounded by possessions that make us happy just by looking at them, there are traps waiting everywhere.